Sliding Door Locks and Latches are a crucial component for any sliding mechanism. Having the correct system in place will ensure you have optimised the effectiveness of sliding products and provide doorways and cupboards with much needed structural solidity. We have the Union 2401 Satin Chrome Lever, offering a solid and practical method to locking any sliding doors. The product boasts either a stainless steel or brass striking plate to guarantee optimum solidity at all times. The Satin Chrome lever is best suited to doors made from timber and can be installed onto material as thick as 54mm. 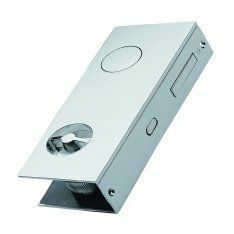 For an alternative method to strengthen your sliding door, we have a range of pull latches such as the Set Satin Chrome Sliding Door Pull Latch. This modern design has been manufactured in Italy, where careful precision and execution has enabled this product to serve as both an innovative and methodical way to add strength to your sliding door. All the required materials necessary for the installation of a sliding door can be found in any of our Sliding Door and Pocket Door Gear products. This selection offers all the components needed to install a strong and structurally sound method to open both doorways and cupboards. Finally, to add the final touch to your sliding door structure, we have a range of Sliding Door Furniture. These products have been specially modified to ensure you have installed your sliding door with the optimum level of precision.